“In 2001 we adopted the slogan ‘Lest we forget’ and It is fantastic that the sailing community has kept this event going year after year. It’s truly gratifying that seventeen years later we have the full support of the sailing community and the Newport Shipyard as host,” says Scotty Murray (Middletown, RI) a co-founder of the event. The race began as a clockwise circumnavigation of Conanicut Island in a light Northerly of 4-6 knots. Soon after the series of starts, the breeze dropped even lower. The first group of boats made it around Beavertail but entered the West Passage into current. The combination of an ebb tide and extremely light wind made for a challenging trip up to the Northern tip of Jamestown - the half way point before the boats would turn south back to Newport Harbor. Over 200 sailors convene at Newport Shipyard for the after party & prize giving. The remainder of the fleet stalled off of Beavertail hoping for the southerly to propel them up the West Passage. Before the southerly filled, a small number of boats caught a transitional westerly and were able to pass under the Jamestown Bridge headed North. Once the Southerly did fill in, the back of the fleet was then able to gain momentum and close in on the lead pack. During the last half of the race the breeze picked up to 6 – 10 knots as the entire fleet headed south towards Newport Harbor through the East Passage. Even though the breeze improved, the course was shortened to finish boats under the Pell Bridge which avoided a time limit expiration for some competitors. The J/22 fleet sailed a different course from the PHRF fleet. From the starting line outside of Newport Harbor the Sail Newport fleet of boats and crews sailed south to a rounding mark off Castle Hill and then back up to finish under the Pell Bridge. The top three winners were announced at the social in each of the seven classes. Newport sailors Phip Hallowell and Chuck Brown on the VX One, The Wagon, conquered the overall PHRF classes on corrected time. Hallowell and Brown also won first place in the PHRF Spinnaker Class 2. 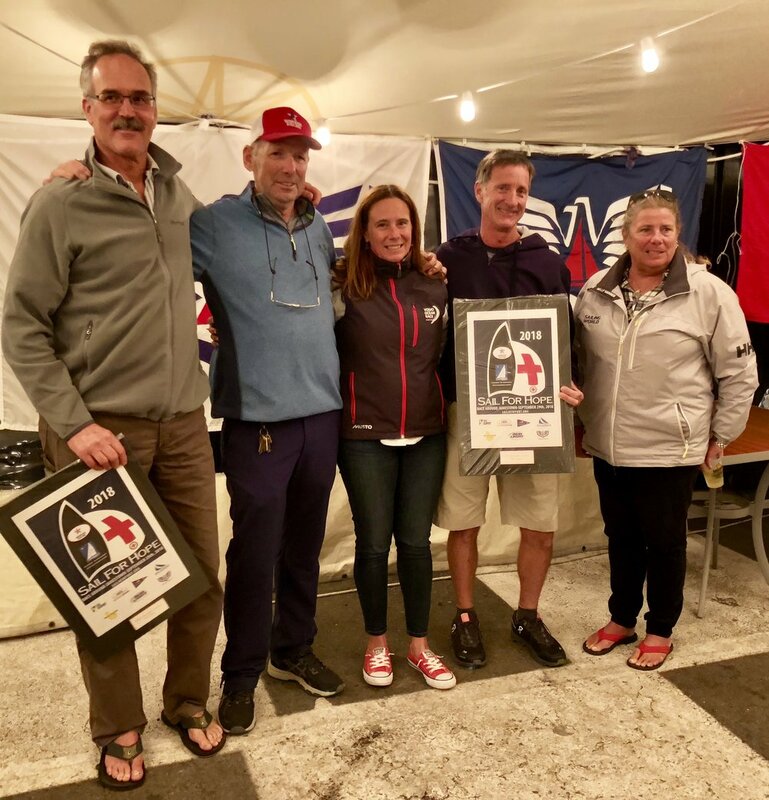 Phip Hallowell & Chuck Brown on their VX One The Wagon take overall honors for the 2018 Sail for Hope. Because the race is primarily a fundraiser, the most accolades are reserved for the crew who collectively raises the most funds for the charities. The top fundraising honor was awarded to "Reef Points," helmed by owner Gurdon Wattles of Little Compton, RI with crew members Bill Titus (Newport, RI), Christine Mills (Newport, RI), Larry Marusi (Norwalk, CT), Alastair Lenz who is the nephew of Tad Sanchez for whom the charity is named (Newport, RI), Henry Little (Tiverton, RI), Jay Mulrooney (East Greenwich, RI), Peter Manikas (Attleboro, MA), Barby Macgowan (Newport, RI), Bill Macgowan (Newport, RI), Justin Backus (Newport, RI), Doug Ferguson (Stonington, CT) and John Gower (Newport, RI).